A well-kept lawn near the house is a natural decoration that will never go out of style. Neatly trimmed grass pleases the eye in any weather - lit by the bright sun, in the rain, with drops of dew, even looking out from under the snow. But a real lawn requires regular care, the most time consuming part of which is cutting and cutting grass. Manual braids have long been out of use, you can only see them in real reactionaries and lovers of antiques. Moreover, with their help, it is quite difficult to mow the grass on the lawn ideally - the skill has gone into the past with the tool. Replaced by motorized trimmers and lawn mowers - electric and gasoline. A small niche is occupied by mechanical lawn mowers that are not equipped with an engine, but they are not particularly popular. 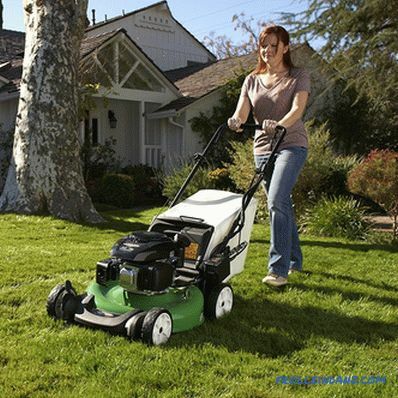 Despite the huge number of models, the main types of lawn mowers are no different. They can be divided into two large groups - trimmers (motokos) and mowing machines - wheeled lawn mowers, riders, tractors. 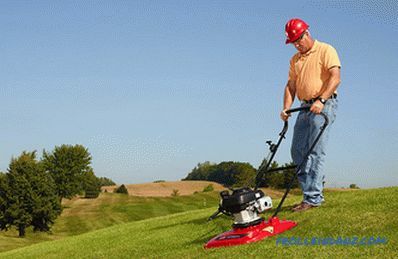 Most of them use the same principle of mowing with a rotating rotor equipped with a cord cutting part or metal blades. When rotating at high speed, they cut the grass at a given height, chopping the bevelled part. 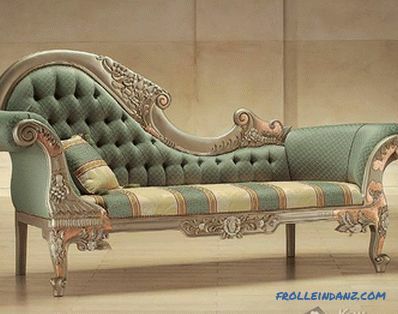 They differ in design features: sizes; type and engine power; feature set; cost; convenience of use. The easiest to use are trimmers, and they are also the most versatile. You can not only level the grass on the lawn, but also harvest hay for the winter, mow weeds on roadsides and farmsteads, and remove shrubs in the gardens and lawns. 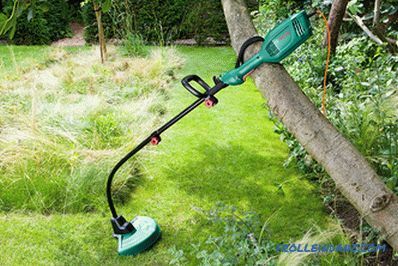 Some models of trimmers are called brush cutters - they can cope with young trees with a trunk diameter of up to 3-4 cm, while not losing the possibility of grooming the lawn. But on large, flat areas of lawns, where grass cutting at the same height is required, they are not entirely convenient - it is very difficult to achieve a stable position of the cutting part. Motokosa, especially powerful, is a rather heavy and cumbersome tool. It is indispensable in hard-to-reach places, on difficult terrain, at fences, borders, on rocky soil. 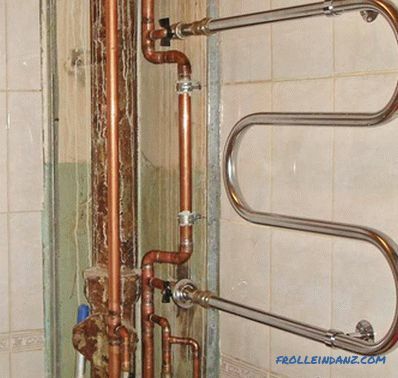 By design, the trimmer is a fairly simple system consisting of an electric or gasoline engine (usually a two-stroke engine) and a rotating head, in which there is a fishing line or metal string wound onto a reel which are released on 15 - 40 cm on both sides and when rotating, perform the functions of knives. The cutting part can be mounted directly on the motor shaft, at its lower position. Or connected to it with a metal cable or rod (at the top location of the motor). It should be noted that the motokos with the upper engine is much more convenient in work - they are balanced in weight and allow you to work for several hours in a row without much operator fatigue. These garden machines are more convenient and easy to use. They practically do not require physical effort; a person of any physical constitution can cope with them. The base of the lawn mower is a wheeled cart, equipped with four support wheels, which can be connected with the engine by a drive system (two or all four), or roll freely. Self-propelled types of motor-driven lawn mowers are very convenient in large areas of lawns, parks and squares. 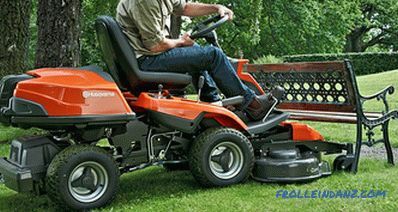 If you have to work for several hours or even a whole day, then lawn mowers with driving wheels are indispensable. In small areas and areas of complex configuration, machines are more convenient for cutting without a drive to the wheels. The fact is that they are much easier to maneuver and move forward or backward. Not all models of self-propelled mowers are equipped with a reverse system, their speed is also regulated in a fairly narrow range and, for example, an elderly person, it is sometimes difficult to keep the unit in hand, even when driving at minimum speed. a box or bag for collecting mowed grass. Lawn mowers are equipped with a grass collector, but some models of lawn mowers are not equipped with a grass collector - they grind the grass to a state of rot and leave it on the lawn as mulch and natural fertilizer.Many gardeners consider this method of mowing the only acceptable option for lawn care, which allows fertilizing it without using mineral and other fertilizers and preserving the natural state of the soil, without drying out and compaction. 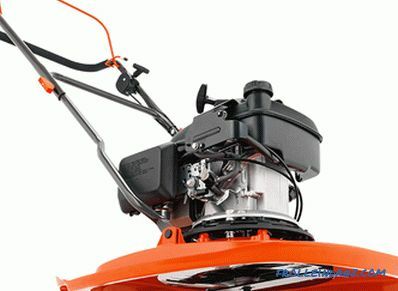 According to the design of the cutting part, wheel mowers are divided into rotary mowers, which have already been mentioned, and drum (cylindrical). 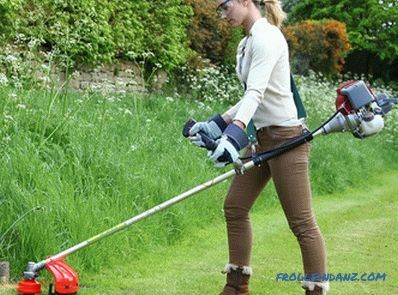 The first ones are equipped with horizontal blades with sharpened edges that rotate in a horizontal position, relative to the vertical axis, and cut the grass very clean and even - the rotation speed is high enough so that even soft grass does not wrinkle, but cut. 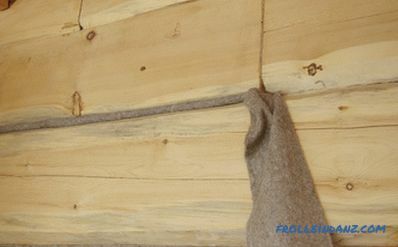 The height of the blade is adjustable in a fairly large range, usually from 2 to 7 -10 cm. 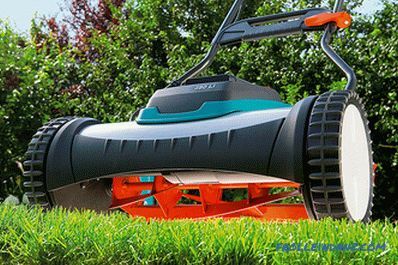 Cylindrical mowers are equipped with a horizontal shaft, which rotates clockwise, and a horizontal fixed knife. 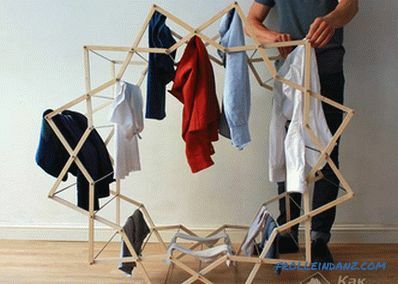 The shaft is also equipped with cutting blades running along its entire length, the number can reach 12 pieces. Rotating on a horizontal axis, passing perpendicular to the direction of movement of the lawn mower, the shaft presses the grass to a fixed plate of a horizontal knife and cuts it almost perfectly evenly. In terms of productivity and quality of mowing, cylindrical types of lawn mowers are far superior to rotary lawn mowers, but only on low soft grass. If the height of the grass cover exceeds 10 - 12 cm, then it is better to use the rotor mower. The capabilities of a cylindrical mower also depend on the number of knives per shaft - the smaller they are, the easier it will be to cope with tall and tough grass. Optimally buy for home use machines with three to five knives. 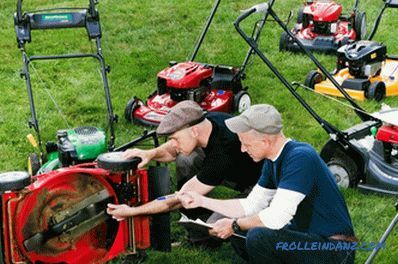 Cylinder lawn mowers are significantly more expensive than rotary mowers, so they are losing in popularity. 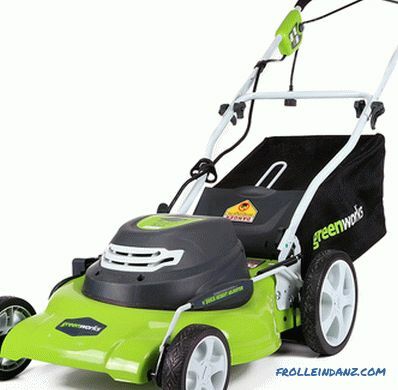 They can be attributed to the professional class of equipment for mowing grass and lawn care. They are appropriate in areas of 0.5 hectares - in a park area, in stadiums, gentle banks of water bodies and other places where working with a conventional lawn mower will be very tedious. Riders and mini tractors differ in the location of the mower unit - it is located at the bottom of the tractor, between the front and rear wheels, and at the front of the rider. In addition to the mowing unit, a number of other equipment can be connected to the power take-off shaft of these machines, which makes it possible to consider them a fairly universal technique, for which the care of lawns is only part of the scope of use. Practice shows that devices that seemed unusual, exotic, and even funny a few years ago, machines and mechanisms very quickly become familiar and actively push traditional systems out of use. Probably, exotic types of lawn mowers, which are increasingly used not only abroad, but also appear in our country, will not be an exception. These include air cushion mowers and robots. 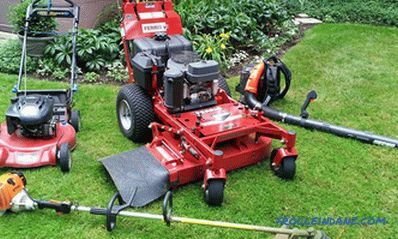 In this type of lawn mowers, special-purpose knives are used, which are both propellers that create a directional air flow and raise the installation above the ground to a small height. It soars there on the air column and mows the grass at a given level. To move it over the lawn is extremely easy, as well as maneuvering. 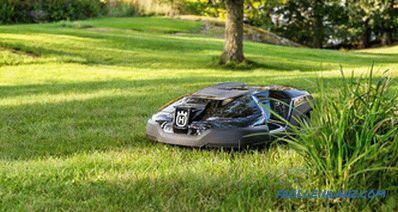 Robotic lawn mowers work without human intervention, according to the principle of a well-known robot vacuum cleaner. It is enough to protect the site with ropes stretched at a certain height and start the car inside the perimeter - the perfect mowing is guaranteed. So far the proliferation of these types of lawn mowers has been hampered by some imperfect structures and high prices. But we have become accustomed to, that progress is inexorable and it will not take long to wait for the active development of these areas. Kinds of lawn mowers by type of engine are limited to two options - electric and petrol. Diesel engines in these machines (with the exception of some models of mini-tractors and riders) are not used due to the heavy weight, design complexity and low shaft rotation speeds. 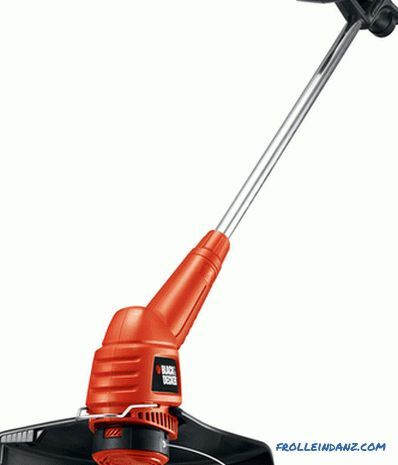 Trimmers and lawn mowers with electric motors are very convenient in small areas near the house. 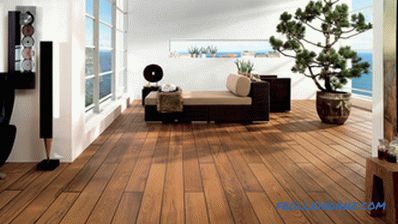 They are productive, quiet, light, do not require complex maintenance. During operation, very few requirements are put forward. 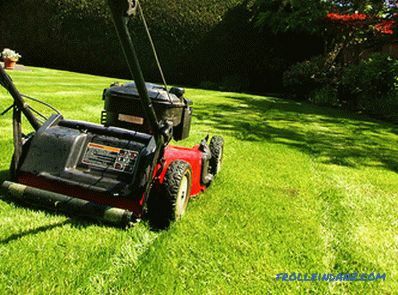 The main ones are not recommended to mow wet grass and not to overload the engine, it should work at a stable speed. With heavy loads and frequent reduction of the rotational speed, the engine overheats, which leads to its failure, and repairing such motors is expensive and difficult. In addition, the cable trailing behind the lawn mower or trimmer is not only inconvenient, but also limits the radius of the working area. 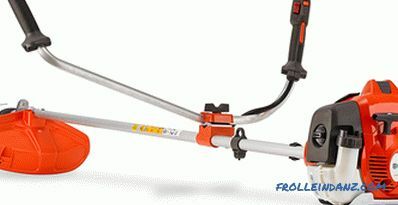 If you have to mow between trees, it is better not to find a gas trimmer. 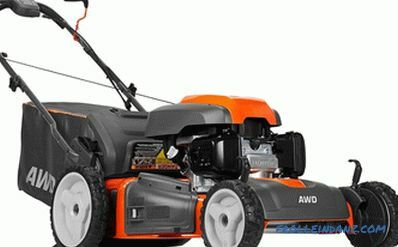 A lot of trimmers and wheel mowers are made on the basis of two and four-stroke gasoline engines. 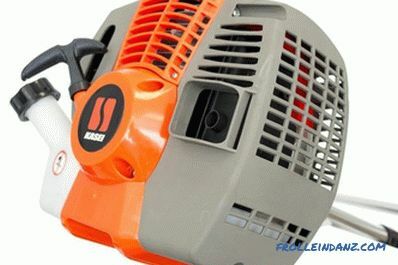 For trimmers, two-stroke engines are usually used, as they are lighter, quite powerful and easy to maintain. Wheeled mowers are equipped with both types of gasoline engines, depending on the size and required performance. Petrol mowing machines have a high level of autonomy, a significant resource (2-8,000 hours), depending on the engine brand, maintainability. They are quite economical - even if you use high-quality fuel and brand brands of oils (it is not recommended to do anything else), the cost of operating a gasoline mower or trimmer will not exceed the cost of one or two car trips over a distance of 150-200 km.